Uttarakhand is a beautiful State with ancient yoga schools, holiday spots, wildlife sanctuaries etc. This state is also known as Dev Bhoomi due to many ancient temples all over the state. Uttarakhand shares borders with Himachal Pradesh in North West and Uttar Pradesh in South. Every evening at sunset priests perform Ganga Aarti on the banks of river Ganga at Har Ki Pauri, Haridwar. A large number of people gather every day on both sides of banks of river Ganges to sing its praises. This looks so beautiful and serene, one should never miss this if you are visiting Haridwar. Tungnath is the highest Lord Shiva temple in the World. Tungnath literally means (Lord of Peaks) mountains forms the Alaknanda and Mandakini River Valleys. This temple is believed to be 1000 years old. It has linked to Pandavas and Fighters of Mahabharata epic. Jim Corbett National Park of Nainital district is oldest national park of India which was established in 1936 for the protection of tigers. Rajaji National Park, Gangotri National Park, Nalanda Devi National Park are some other national parks of this State. The Emblem of Uttarakhand shows mountain ridge with the flow of holy river Ganga and in the mid of mountain peaks is National Emblem of India showing Satyamev Jayate. The state animal of Uttarakhand is Himalayan musk Dear, the state bird is Himalayan Monal, the state flower is Brahma Kamal and the state tree is Burash. The two most sacred rivers as per beliefs of Hindus Ganga and Yamuna originate from Uttarakhand State. While Ganga originates from Gangotri and Yamuna originates from Yamunotri. Nanda Devi is the highest peak of Uttarakhand with an altitude of 7816 mtr. This also the second highest peak of India after Kangchenjunga. Kamat and Badrinath are second and third highest peaks of Uttarakhand with a height of 7756 and 7138 mtr. Tehri Dam built on the Bhagirathi River near Tehri Garhwal in is the tallest dam in India and one of the tallest in the world. This dam is a reservoir for irrigation, municipal water supply and generation of 1000 MW of Hydroelectricity. The power from this dam is distributed to Punjab, Delhi, Haryana, Jammu & Kashmir, Rajasthan etc. The others dams in Uttarakhand are the Baigul dam, Koteshwar dam, Bhimtal dam etc. 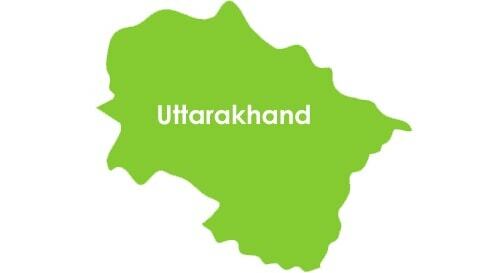 On November 9th, 2000, Uttarakhand became the new state after it was separated from Uttar Pradesh. Previously the name of the state was Uttaranchal until 2007 when it was renamed as Uttarakhand. Uttarakhand is the 27th state of India while Dehradun is the capital of this state and the high court is in Nainital. The state is divided into two parts Garhwal and Kumaon region. In 1891 two districts of Kumaon and Tarai were redistributed and renamed after their headquarters Nainital and Almora while In 1969 Garhwal division was established and Pauri made its headquarters. There is two famous mountaineering institute which is in Uttarakhand first is Nehru Institute of Mountaineering situated in Uttarkashi which is most prominent mountaineering institute and was set up in 1965. It provides various courses like the adventure course, searches and rescues course, methods of instruction course etc. Another one is Pandit Nain Singh Surveyor Mountaineering training institute situated an altitude of 2200 m in Munsiyari that is located in Pithirogarh District of Uttarakhand. This state is also called dev Bhoomi due to many religious sites such as Haridwar, Rishikesh, Gangotri, Yamunotri, Badrinath, and Kedarnath. Uttarakhand is the only state in India which has Sanskrit as its official languages. The main regional languages of this state are Garhwali and Kumaoni while Hindi is most widely spoken language of this state. The important festivals of this state are Kumbh Mela, Nanda Devi Mela of Almora, Gauchar Mela of Chamoli, Uttariani Mela of Bageshwar, Purnagiri Mela, Devidhura Mela, Nanda Deviraj Jat Yatra etc. Uttarakhand has many tourist places such as Mussoorie which is also known as Queen of Hills and Auli, Rishikesh, Haridwar, Uttarkashi, Nainital, Almora, Dhanaulti, Rudraprayag etc. These places attract thousands of tourists not only from India but from all over the world. Bachendri Pal who is first Indian woman to reach Mount Everest belongs to Uttarkashi district. Abhinav Bindra the famous sportsperson and shooter were first Indian to win Gold Medal in shooting at Beijing Olympics. Govind Vallabh Pant was a socialist and freedom fighter. Sumitranandan Pant was a famous Hindi writer. The key industries of this state are tourism and hydroelectric power generation. Uttarakhand is the fastest growing states of India after Madhya Pradesh. The Minerals resource of this state is limestone, rock phosphate, copper graphite, gypsum etc. There are so many prestigious institutes in this state like Indian Institute of Technology which is in Roorkee, National Institute Of Technology which is in Srinagar. Indian Institute of Management in Kashipur and All India Institute of Medical Sciences in Rishikesh and H.N.B Garhwal University which is recognized as a Central University located in Srinagar.